Engine maker Rolls-Royce has lifted the lid on its plans to create a flying taxi cab that could carry four to five passengers and reach speeds of up to 402 km/h (250 mph) for about 500 miles. The British company unveiled an early design for the "electric vertical take-off and landing" (EVTOL) concept vehicle at the Farnborough International Airshow 2018 in the UK. It has already begun designing the concept for a new propulsion system that would enable the EVTOL to take to the skies. According to a blog post from Rolls-Royce, this system uses gas turbine technology to generate enough electricity to power propulsors, which would be designed to have a low noise profile. It would also be able to take off and land vertically thanks to rotating wings. This means it could be used in existing airports and heliports. Although the company unveiled an early concept for the flying taxi, it believes it could be buzzing around as early as the 2020s. And there's scope for it to be used as public transport, but it could also be adapted for personal transport, logistics and even military applications. Rolls-Royce isn't the first company to claim to be making all of our sci-fi dreams come true and developing flying vehicles. 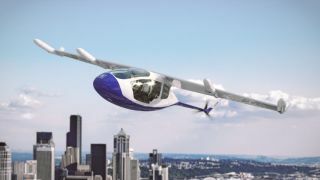 Aerospace company Airbus and ride-sharing company Uber are just two of a handful of big names and smaller start-ups that have already released details about their own projects that involve flying car tech. Main Image: An artist's impression of the EVTOL, which could carry four to five passengers. Credit: Rolls-Royce.